"Cape Elizabeth" redirects here. For the cape in Russia, see Cape Elizabeth (Sakhalin). Cape Elizabeth is a town in Cumberland County, Maine, United States. 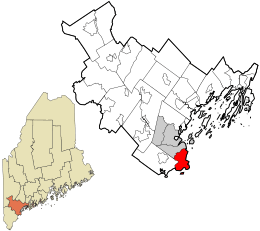 The town is part of the Portland–South Portland–Biddeford, Maine metropolitan statistical area. As of the 2010 census, Cape Elizabeth had a population of 9,015. 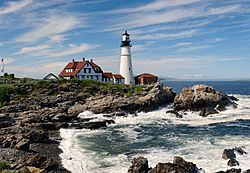 Cape Elizabeth is the location of the Beach to Beacon 10K road race that starts at Crescent Beach State Park (the "beach") and ends at Portland Head Light (the "beacon"). The race draws runners from all parts of the U.S. and elite athletes from around the world. Cape Elizabeth only has one school department. Cape Elizabeth High School's team name is the "Capers". At the southern tip of the promontory, Richmond Island was visited about 1605 by Samuel de Champlain and was the site of a trading post in 1628. John Smith explored and mapped New England in 1615, and gave names to places mainly based on the names used by Native Americans. When Smith presented his map to King Charles I, he suggested that the king should feel free to change any of the "barbarous names" for English ones. The king made many such changes, but only four survive today, one of which is Cape Elizabeth, which Charles named in honor of his sister, Elizabeth of Bohemia. The first habitation by Europeans was on Richmond Island. Without title, Walter Bagnall (called "Great Walt") in 1628 established a trading post, dealing in rum and beaver skins. "His principal purpose appears to have been to drive a profitable trade with the Indians," writes historian George J. Varney, "without scruple about his methods." His cheating caught up with him in October 1631, however, when he was killed by the Indians, who also burned down his trading post. Two months later, the Plymouth Company granted Richmond Island to Robert Trelawney and Moses Goodyear, merchants of Plymouth, England, who made it a center for fisheries and trade. By 1638, Trelawney employed 60 men in the fisheries. The first settlers on the mainland were George Cleeve and Richard Tucker, who settled in 1630 on the shore opposite the island, and near the Spurwink River. They worked at planting, fishing and trading. Two years later they were driven off by John Winter, Trelawny's agent. In 1636, Sir Ferdinando Gorges, lord proprietor of Maine, gave Cleeve and Tucker a grant of 1,500 acres (6.1 km2) including the neck of land called Machegonne—now Portland. In 1643 English Parliamentarian Alexander Rigby bought the large existing Plough of Lygonia patent which included the entire area including Cape Elizabeth. The Cape Elizabeth settlement located on the Fore River would be known as Purpoodock. It was attacked during King Philip's War in 1675. During King William's War, in Major Benjamin Church's second expedition a year later on 11 September 1690, he arrived with 300 men at Casco Bay. He went up the Androscoggin River to the English fort Pejepscot (present-day Brunswick, Maine). From there he went 40 miles (64 km) upriver and attacked a native village. Three or four native men were shot in retreat; Church discovered five English captives in the wigwams; six or seven prisoners were butchered as an example; and nine prisoners were taken. A few days later, in retaliation, the natives attacked Church at Cape Elizabeth on Purpooduc Point, killing seven of his men and wounding 24 others. On September 26, Church returned to Portsmouth, New Hampshire. In 1703, during Queen Anne's War, the town was destroyed. It would be resettled about 1719 or 1720. Cape Elizabeth became Maine's twenty-third town on November 1, 1765, when it separated from Falmouth, as Portland was then known. Its first town meeting was held on December 2, 1765. South Portland separated in 1895 from Cape Elizabeth, which contains a number of houses designed by John Calvin Stevens. 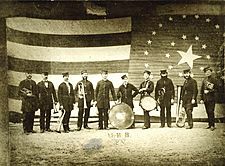 In 1872, construction of an artillery base began around Portland Head Light, which in 1899 would be named Fort Williams, after Major General Seth Williams of the Civil War. The fort was to guard the southern entrance to Portland Harbor. Active between 1899 and 1962, the fort was then purchased by the town for about $200,000. Today, Fort Williams Park includes Portland Head Light and museum, some remains of the military fort, the ruins of Goddard Mansion, tennis courts, a baseball diamond and grandstand, and other recreation facilities. The park is maintained by the town which has repeatedly opted out of parking fees to ensure the park is maintained for use free of charge to the public. According to the United States Census Bureau, the town has a total area of 45.93 square miles (118.96 km2), of which, 14.70 square miles (38.07 km2) of it is land and 31.23 square miles (80.89 km2) is water. The nearest city is Portland. Cape Elizabeth shares a border with South Portland to the north and Scarborough to the south. The town includes two islands. Ram Island is a small and unoccupied island directly adjacent to Ram Island Ledge, home of the recently privatized Ram Island Ledge Light. The 226-acre (91 ha) Richmond Island, originally inhabited by Native Americans, then English settlers, is now uninhabited except by a small herd of sheep. It is privately owned by the Sprague family, the most prominent property owners in Cape Elizabeth, whose substantial estate also includes Ram Island Farm on the mainland. Cape Elizabeth is the home of three coastal parks: Fort Williams Park, Two Lights State Park, and Crescent Beach State Park. Additionally, the Cape Elizabeth Land Trust, a private non-profit corporation, protects 560 acres (230 ha) of land on 22 different parcels for public use, maintaining a large system of connecting non-motorized trails on most. The town itself has 923 acres of land owned or under easement protection for conservation purposes. As of the census of 2010, there were 9,015 people, 3,616 households, and 2,620 families residing in the town. The population density was 613.3 inhabitants per square mile (236.8/km2). There were 3,963 housing units at an average density of 269.6 per square mile (104.1/km2). The racial makeup of the town was 96.6% White, 0.5% African American, 0.2% Native American, 1.4% Asian, 0.1% Pacific Islander, 0.3% from other races, and 1.0% from two or more races. Hispanic or Latino of any race were 1.4% of the population. There were 3,616 households of which 33.5% had children under the age of 18 living with them, 62.5% were married couples living together, 7.3% had a female householder with no husband present, 2.7% had a male householder with no wife present, and 27.5% were non-families. 22.9% of all households were made up of individuals and 10.7% had someone living alone who was 65 years of age or older. The average household size was 2.49 and the average family size was 2.95. The median age in the town was 46.8 years. 25% of residents were under the age of 18; 4.5% were between the ages of 18 and 24; 17.3% were from 25 to 44; 37.3% were from 45 to 64; and 16.1% were 65 years of age or older. The gender makeup of the town was 48.2% male and 51.8% female. As of the census of 2000, there were 9,068 people, 3,488 households, and 2,605 families residing in the town. The population density was 615.5 people per square mile (237.7/km²). There were 3,724 housing units at an average density of 252.8 per square mile (97.6/km²). The racial makeup of the town was 98% White, 0.3% African American, 0.06% Native American, 0.99% Asian, 0.06% Pacific Islander, 0.12% from other races, and 0.49% from two or more races. Hispanic or Latino of any race were 0.50% of the population. There were 3,488 households out of which 36.0% had children under the age of 18 living with them, 65.7% were married couples living together, 6.5% had a female householder with no husband present, and 25.3% were non-families. 21.1% of all households were made up of individuals and 9.9% had someone living alone who was 65 years of age or older. The average household size was 2.57 and the average family size was 3.01. In the town, the population was spread out with 26.5% under the age of 18, 3.7% from 18 to 24, 23.5% from 25 to 44, 30.3% from 45 to 64, and 16.0% who were 65 years of age or older. The median age was 43 years. For every 100 females there were 91.4 males. For every 100 females age 18 and over, there were 85.4 males. The median income for a household in the town was $72,359 (2007 est. 92,604 aol.realestate.com), and the median income for a family was $106,126 in 2000. Males had a median income of $61,128 versus $32,500 for females. The per capita income for the town was $47,983. About 1.3% of families and 3.1% of the population were below the poverty line, including 1.5% of those under age 18 and 8.1% of those age 65 or over. Cape Elizabeth, Maine Facts for Kids. Kiddle Encyclopedia.